For Fresh Water Pearl Powder GO HERE. Authentic Pearl Powder is 4000 mesh for Perfect absorbability and efficacy. We aced the tests by WHO GMP for product control, integrity, purity and safety. They guarantee that our product is of Most astounding quality. This is the Beauty Secret of the elite, Queen of all beauty hebals, Mother of all superfoods. Superior grade offers outstanding performance. Pearl Powder "The New Anti-Aging Miracle - Passport To The Fountain Of Youth". Since the beginning of time Pearls were treasures of the earth, valuable and sought after. Today, they are brought to you in pulverized form, for ageless, radiant beauty, a strong healthy body and longevity, at a price you can afford. Pearls have been used throughout history to help treat the digestive tract order, as well as muscular systems and skin. Pearl powder is known to be one of the top herbs for beauty, it is the Queen of all Beauty herbals. Pearl powder was created by grinding real pearls into a fine powder that can be used topically or orally. There are secret Healing Properties in Pearls. Pearl powder can range anywhere from an elixir of youth to a cure all for many of life’s ailments. The use of pearl powder will reduce the appearance of scars, stretch marks, and fine lines and wrinkles. It accelerates the skins rejuvenation process, which creates more visibly radiant skin and heals acne and blemishes. Pearl powder is not a new beauty treatment, having been highly prized by royalty in Egypt and China even during ancient times. Cleopatra and Wu Zetian, were famed for their use of pearl powder to maintain and achieve their youthful, beautiful skin. Cleopatra bathed in Pearl Powder, honey and Milk. Their use in China of both as a medicine and as a cosmetic, dates back at least to 320 AD where it was sought by emperors and empresses alike. Pearl Powder is the Superfood From the Sea; Rich in Health Boosting properities; it is one of the most precious dietary supplements from the Orient, providing a range of novel components that supports radiant health and skin. Pearl powder has shown promising results in increasing lifespan and stimulating the production of various antioxidants and biochemicals that have a connection to increased longevity and overall health and wellness. 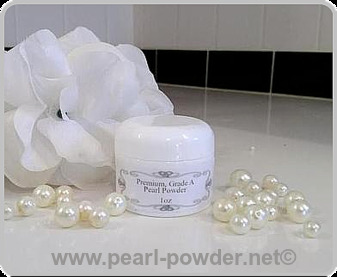 Pearl Powder transforms skin, promotes good health and strong bones. Pearl is a powerhouse of vital amino acids as well as a multitude of beauty properties to keep you young and healthy throughout your aging years. Taken internally or applied externally, our refined High quailty pearl powder brings a pearlescent shimmer to the skin, promotes healing, and delivers miraculous medicinal properties to the skin, hair, nails, health, and body. Pearl Powder is an Ancient Chinese beauty secret that has been used for over 3000 years, by Emperor's and Empress's alike. In fact, Empress Dowage who was a powerful and charismatic woman who unofficially but effectively controlled the Manchu Qing Dynasty in China for 47 years was an avid fan of Pearl Powder. She not only used Pearl powder on her face, but she ingested it daily. It was a beauty treasure that women used throughout the Orient for lustrous, soft, sikly skin, and gave them a radiant, youthful appearance. The Empress Dowager was famous for her beauty and her childlike skin even at the age of 74. Visual artistes in the China Tang Dynasty when applying stage makeup used Pearl Powder to beautify and protect their skin. And Wu Ze Tian also used Pearl Powder internally and externally and her skin was said to be as beautiful and radiant as younger woman. Authentic Pearl powder is a finely milled powder made from the Highest Quality pearls and disinfected, 100% Pure, medical grade, 4000 mesh for easy absorption and optimal performance. Contains peptides, 9 kinds of protein, 17 amino acids and more than 30 trace elements. Pearl powder is a potent antioxidant that enhances the activity of Superoxide Dismutase (SOD), one of the body's strongest antioxidant enzymes. Pearl also contains “signal proteins” that help to maintain youthful skin tone, stimulate new bone growth, and increase existing bone density. Plus non-protein acid and taurine, which aids in inflammation, relieves pain of joint swelling, and skin fatigue. And because SOD eliminates free radicals, skin aging and wrinkling can be prevented. Royal inhabitants of the Chinese Imperial Palace swore by the miraculous regenerating effects of pearl powder, which they used for healing and skin brightening. Pearl powder promotes the production of collagen and elastin in your skin. It also has special attributes for removing acne, acne scars, skin ulcers, melasma (which causes freckles, age spots, and dark patches on the skin), wrinkles, as well as nourishes the skin and makes it smooth, elastic, healthy and naturally beautiful. Pearl Powder also contains a natural sunscreen. Pearl Powder acts as an antioxidant and promotes production of glycosaminoglycans. GAGs are the major sulfated glycan in green algae found in the ocean which oysters feed off of. GAGs are sulfated glycans that regulate various biological and medical functions. Glycosaminoglycans' primary role is to maintain and support collagen, elastin and turgidity (bounce) in the cellular spaces and keep protein fibers in balance. The sea is a wealthy environment of unique GAGs. What mysteriously lies deep within the pearl has the power to renew and restore the entire human body. Pearl Powder dramatically reverses the aging process: It suspends the evidence of time. You can actually turn back the hands of time with our Prime, Medical Grade Pearl Powder. What Makes Our Pearl Powder So Powerful And Effective? To guarantee high quality and peak performance, our Pearl Powder is made in it's own manufacturing company by natural process. Their processing technology ensures that all signal proteins, nutritional value, and ingredients are preserved, and refined. They are in strict accordance with quality control regulations for safety and effectiveness. Pearl is the purest source of calcium available. While calcium is one of the four most important minerals needed by our bodies (magnesium, potassium and sodium are the other three) Pearl Powder contains them all. Store bought calcium can cause calcification. Calcification is the buildup of calcium in tissues where it does not belong, resulting in the hardening of tissue, that can be unpleasant or dangerous. Calcification can occur in the breast tissue, the coronary arteries and in the heart valve. Dead and degenerated tissues can also be affected. The results: joint pain, arthritis, kidney stones, cardiovascular problems, cataracts, cellulite, and cancer! Calcium carbonate in Pearl Powder, when taken internally, strengthens bones, muscles and nerves. In fact, Scientist revealed that pearl can activate new bone foundation and development, and increase bone mineralization. Pearl taken internally build cells, protects us from bacteria, viruses, and the development of cancer cells. French scientists have proven that pearl can reduce bone loss. Chinese scientists discovered that calcium from pearl is more easily absorbed by the body than calcium pills. Pearl has a significantly higher bone mineral density (HBMD), higher bone calcium content and higher total bone weight that regular calcium. Scientists discovered that pearl is one of the most effective ways to prevent osteoporosis. Pearl Powder will keep your bones strong and healthy. The essential building blocks of collagen and protein each have a specific function. Lacking any one of the key amino acids causes the skin to look tired, and waned. Researchers claim that various components of pearl can stimulate the metabolism's activities of the genetic material in a cell - the DNA and RNA - thus promotes and accelerates the regeneration of new cells. Keeping the DNA molecular structure intact ensures the maximum amount of nutrients and proteins are absorbed by the body. The secret ingredient in pearl is Conchiolin, a tough insoluable complex protein, the outer shell layer called periostracum, composed of the protein conchiolin. It converts into collagen and combines with Epidermal lipids, important factors in the skin's moisture balance. It forms a cement-like barrier to prevent water from escaping which retains the skin's moisture balance, leaving a beautiful glow on the skin. It acts like keratin to repair damaged skin cells, hydrate skin cells, promote skin cell metabolism. It also contains Alkaline Phosphate which prevents the deterioration of cells and epidermal aging. It promotes the development and vitality of the skin. Pearl powder contains signal proteins that stimulate the regeneration of collagen. * Increases SOD activity - Primary Antioxidant, reduces lipofuscin production, which slows aging, cleanses free radicals, and reduces the oxidative degradation of lipids. * Increases Glutathione - The mother of all antioxidants, prevents damage to important cellular components. Glutathione is comprised of three amino acids: cysteine, glutamate, and glycine. It's a vital molecule necessary to stay healthy and prevent disease. SOD and Glutathione have been Proven to strengthen the immunity. * Glycine - an essential amino acid that serves as both an inhibitory and excitatory neurotransmitter. Forms insoluble collagen fiber to moisten skin internally and tone the skin. * Methionine - an essential amino acid that contributes to the skin’s radiance and elasticity as well as the conditioning of hair and nails. * Glycine & Methionine are essential ingredients to produce new skin cells. * Taurine - Repairs damaged skin cells, rehydrates keratinocytes (the main cells of the upper skin layers), re-hydrating skin cells, reduces free radical damage, increases circulation and purifies the blood for clear radiant skin. It calms nerves and regulates the menstrual cycle. * Polyacrylic acid - Super-Hydrates skin cells, repairs damaged skin, retains moisture, increases elasticity, and softens the skin. It rejuvenates the skin as it represses the development of wrinkles and freckles. * Alkaline Phosphatase - a protein found in all body tissues including the liver, bone, kidney, intestine and placenta. It also plays an important role in the growth and development of bones, skin and teeth. It is essential for the process of mineralization, in which minerals such as calcium and phosphorus are deposited in developing bones and teeth. This prevents epidermal aging and deterioration of cells and increases the vitality of the skin. Pearl has other interesting medicinal properties. In China, pearl powder is used to heal wounds because of its antiseptic properties. In the United States, surgeons frequently sprinkle a lower-grade pearl powder, called surgical pearl, into their latex gloves before operating. The soothing, antiseptic pearl powder absorbs excess moisture and helps prevent the spread of infection. Be sure when you buy Pearl Powder you buy Pure, Premium, Ultra-Fine Powder. Our Pearl Powder comes directly from the great South Sea of China. It is not Mother of Pearl! Though both Mother of pearl and pearl are made from nacre, the Mother of pearl is formed in the shell linings, and Pearl is formed when a foreign body is enclosed within a shell. A pearl is made of calcium carbonate, where mother of pearl is not. Natural Pearls have been harvested and cultivated primarily for use in jewelrey. They have also been crushed and used in cosmetics and medicines. Mother of pearl is significantly less expensive than their natural counterparts. The Difference Between Seawater Pearl Powder and Freshwater Pearl Powder? Freshwater and Saltwater pearls may sometimes look quite similar, but they come from different sources. Freshwater pearls form in various species of freshwater mussels, family Unionidae, which live in lakes, rivers, ponds and other bodies of fresh water. These freshwater pearl mussels occur not only in hotter climates, but also in colder more temperate areas such as Scotland (where they are protected under law). Most freshwater cultured pearls sold today come from China. Saltwater pearls grow within pearl oysters, family Pteriidae, which live in oceans. Saltwater pearl oysters are usually cultivated in protected lagoons or volcanic atolls. There are numerous minerals, nutrients and stable pH measurements in Saltwater that Freshwater does not have. Sea pearls contain a wide variety of natural minerals because the ocean is full of minerals and nutrients. Seawater contains more dissolved ions than freshwater. However, the ratios of solutes differ dramatically. For instance, although seawater contains about 2.8 times more bicarbonate than river water based on molarity, the percentage of bicarbonate in seawater as a ratio of all dissolved ions is far lower than in river water. Bicarbonate ions also constitute 48% of river water solutes but only 0.14% of all seawater ions. Differences like these are due to the varying residence times of seawater solutes; sodium and chlorine have very long residence times, while calcium (vital for carbonate formation) tends to precipitate much more quickly. Our Seawater Pearl Powder is Pure, naturally grown in Saltwater, then crushed and shipped to your door. Our Pearl Powder has no additives, no chemicals, it is Pure, Genuine. How safe is Pearl Powder? The medicinal and beauty benefits of pearls have long been proven to be non-toxic and harmless to ingest and when apply topically to skin. Our Pearl Powder is free of toxins, heavy metals, and harmful chemicals; it's all-natural, pure, medical grade and nourishing. It is 100% safe to take on a daily basis. Pearl Powder may have a mild fishy aftertaste, without any peculiar smell. If it is yellow, sour or tastes burnt, then you should not choose it, for it is a not authentic powder. Authentic Pearl Powder does not contain enzymolysis (Chemical change or cleavage of a substance by enzymatic action which removes the taste of fish) thus it may have very slight fish taste. 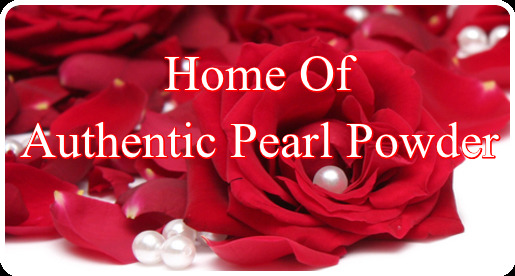 Our Pearl Powder is Chemical, enzymolysis Free, with no Shuck or Gypsum added - It is Pure, Authentic, Real - Not Fake. Authentic powder is a matte white in color and should not have any light reflective particles in the powder. When you rub it against your fingers, it should feel like a smooth fine powder, not sandy, coarse, or gritty. I just opened up your pearl powder, since I was finishing up another brand that I had already purchased. The texture of your pearl powder is much better than anything else I have used. It absorb right into the skin. I really love it. I replaced all of my face powder with your product. The very first time I used Pearl Powder I was amazed at how soft and silky my skin became, after the first application. Everyone says my skin looks like a young woman's. My wrinkles have softened and are fading away, and the tone and texture is amazing. I love Pearl Powder, I just wish I had found it earlier in my life. I take in abused and abandoned animals and I put a little pearl powder in their food. It helps them calm down and makes their coats glisten and shine. I take Pearl Powder daily and I feel Great and my skin looks Amazing.